Please note that we have no salaried employees. All work is done by volunteers. One of the easiest ways you can help fund fibromyalgia research is to order the books written by Dr. St. Amand and Claudia Marek. "What Your Doctor May Not Tell You About Fibromyalgia", "What Your Doctor May Not Tell You About Fibromyalgia Fatigue", and the companion "Lecture and Mapping DVD" that are the definitive references on the treatment of fibromyalgia using the guaifenesin protocol. Sales of the Forum Newsletter and Symptom Journals also benefit our work. Unfortunately we cannot accept online orders. Please see our order form for complete details. Research money is always scarce. Your contribution is critically important to our research projects. The simplest method is to send a check to the address below. Your donation is fully tax deductible and you will earn the abundant gratitude of thousands of fibromyalgia patients. There are many ways you can support this worthwhile effort. You can ask your employer if your company has a matching contribution plan; If you have stock or mutual fund shares that have appreciated in value, you can donate them to The City of Hope Fibromyalgia Research Fund and, in most cases, take a tax deduction for the full market value without paying capital gains tax. Consult your tax advisor to determine which method is best for you. Whichever method you choose, your generosity is vastly appreciated. 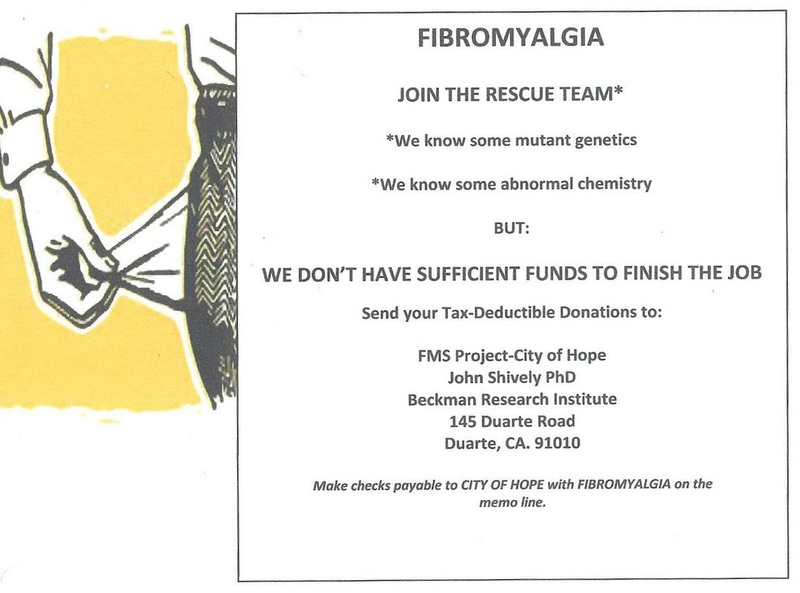 CHECKS SHOULD BE MADE PAYABLE TO: City of Hope, Fibromyalgia Research. Founded by dentist Flora Stay, Cleure (a fusion of Clean and Pure) leads a wellness revolution! All products are salicylate free and all sales benefit the mission of The Fibromyalgia Treatment Center. You can order online or by calling 888-883-4276. Be sure to mention the FTC so that we'll receive credit for your order. Their website also contains educational material about cosmetic ingredients (they are members of safecosmetics.org) and information about making your own products. Flora has written a book and articles about Fibromyalgia and chronic illness and dental issues---she will also answer email and help patients: flora@cleure.com. "We are grateful to them for their support of our work. Many would have faltered without their dedicated existence. Simple thanks is hardly sufficient." writes Dr. St. Amand.